University of Virginia historian Alan Taylor reminds us of the cruelty and suffering native peoples endured at the hands of European ‘immigrants’. The Spanish were famously cruel, but California natives suffered even more after 1846, when the United States annexed vast tracts of Mexican land, justified by the doctrine of ‘Manifest Destiny’. The state of sunshine and pleasure is drenched in the blood of Indians, the victims of mass killings. These peaked between 1846 … and 1873, when they [the US conquerors] snuffed out the last group resistance by natives in the state. The slaughter of California’s Indians was rapid and thorough even by the grim standards prevailing elsewhere in North America. Before 1846, California’s native peoples suffered great losses from diseases and dispossession. But Spanish colonizers and their Mexican successors wanted to preserve Indians as mission inmates or as cheap and dependent farm labor. The American newcomers, however, came by the thousands and treated natives as menaces best destroyed, the sooner the better. Lacking firearms, subdivided into many distinct groups, and greatly outnumbered by 1852, the California natives were more vulnerable to attack than Indians elsewhere. … [B]y 1873, roaming bands of Indian-killers played a major role in reducing native numbers by more than 80 percent. Often the massacres erupted as indiscriminate retribution after some starving Indians killed and ate a few cattle. Vigilante gangs also profited by seizing native women and children for sale as slaves, principally in San Francisco. A Sinkyone survivor, Sally Bell, recalled the morning when “some white men came. They killed my grandfather and my mother and my father. …. Then they killed my baby sister and cut her heart out and threw it in the brush where I ran and hid.” …. Alan Taylor, “Golden State Genocide“, New York Times Sunday Book Review, 29 May 2016. 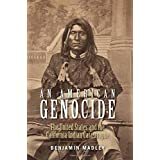 Professor Taylor is reviewing An American Genocide: The United States and the California Indian Catastrophe, 1846-1973, by University of California historian Benjamin Madley (Yale University Press, 2016). The review is favourable. Taylor, though, does not believe the slaughter of Indians constitutes genocide, since it was not explicit policy of the government of the United States to eliminate all Indians. Indeed, “federal treaty commissioners tried to reduce the bloodshed by isolating natives on reservations”. The killings, writes Taylor, were “populist”, involving “thousands of Americans, high and low in society”. Genocide or not, thousands of California natives were slaughtered to make room for immigrants. This shameful fact is not disputed. This entry was posted on Sunday, May 29th, 2016 at 20:29	and is filed under History. You can follow any responses to this entry through the RSS 2.0 feed. Both comments and pings are currently closed.